Tucked in a corner of the museum are two photos of the members of Class '55 - one, in their gala uniform for their formal high school graduation picture; the other as freshmen in their toga in what would then be College Class '59. Between the two photos is written a simple statement: "The making of the museum was, for us, a nostalgic journey of rediscover. It made us remember our beginning and the values lovingly imparted to us by our nuns. Looking back, we understand the relevance of their teachings in our life. Assumption will always be an important part of us." When Sr. Gertrude Borres, president of the Assumption College, proposed that our class spearhead the museum project, we had no idea that accepting the assignment would mean ten months of a veritable emotional roller coaster ride. With trepidation ( fund raising!) and enthusiasm (bouyed by the indomitable Assumption spirit), we gamely set out to do the task at hand. The "highs" were many - togetherness, reminiscing and much laughter, as well as the "lows" - construction delays, missed deadlines, lost photographs, and scant memorabilia (at least at the start). Then, on a trip to the Antipolo campus to scour its "bodega" for what we had hoped would be some rare mementoes, we discovered steamer trunks under layers of dust. These had been brought by nuns who arrived here from Europe in the 1900s. Work then started in earnest. Angelina Esquivel and Marcia Evangelista-Sandoval came on board to research and write the Assumption history, along with Angie Barrera and Chingay Diaz-Lagdameo. To Ana Alfonso-Casas fell the painstaking job of weaving them together. A tribute to Mother Esperanza, the moving spirit behind the reconstruction of Herran and the building of the San Lorenzo campus was contributed bu Maribel Garcia-Ongpin. Putting captions on a slew of photographs that spanned decades seemed not only tedious but also impossible. Claudette Guerrero-Silerio and Consuelo Nieva-Blanch thought it would be intimidating at first, but they helped out and fount it to be enjoyable after all. We thought to feature in the museum, as well, four generations of Assumption Alumnae. Iding Cuaycong-Llamas extended a helping hand in this endeavour. Tracking families and tracing their lineage was ardous work, but- seeing the delighted smiles on the happy faces of the families on opening day - it was well worth it. and missal, as did Nening Pedrosa-Manahan with her Girl Scout uniform, all from the late 40s. A cherished photograph of the nuns of our generations came from Linda Fabella-de Carolis, and from Mila von Heiland Lane, her mother's 1936 annual. Even Ramon Villegas, noted antique collector, lent us valuable photographs of pre-war Assumption. A replica of her first Assumption plaid College uniform of the late 40's was made under the careful supervision of Anita Lopa-Vistan. Having worn one herself, she remembered every detail that went into it. Meanwhile, the fundraising had taken a life of its own. 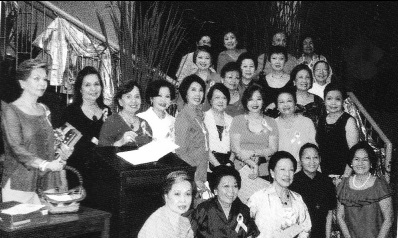 The High School Class of 1960, through Marissa Bautista-Hipolito and Chita Gallaga-Castillo, became a benefactor class. Many alumnae especially from our class followed suit, giving readily and generously to the fund. Their names are engraved in a Donor Plaque, to be remembered with gratitude and appreciation for always. They helped fulfill Sister Gertrude's dream " to put in a 'sacred space' the story of the outpouring of God's love for Assumption and the legacy of Saint Marie Eugenie's vision of transformative education." Our task was to make this "sacred space" breathe life into the teachings and mission of Saint Marie Eugenie to animate and inspire us and future generations of alumnae. Teresa Custodio, our exhibits designer, knew intuitively what needed to be done-reach into the innermost recesses of our mind. She posed this question, "What for you is the essence of your Assumption education that has guided you in life?" The alumnae's response was overwhelming. It was time to put into words what they had known and kept in their hearts-that they are the women they are today-steadfastly striving to be Christ-centered, prayerful, and with a strong social conscience-because of their Assumption education. When the museum opened on March 10, 2009, Saint Marie Eugenie's feastday, they came. "Touched, moved, inspired" - these were some of the sentiments they expressed as they viewed the exhibit with much interest and not a small amount of nostalgia. Suffused with good memories of school days and the nuns who nurtured them, the words of Saint Marie Eugenie rang pure and true and echoed in their hearts. With sudden clarity, they recognized themselves-this is what we were meant to be, this is what Mother Foundress envisioned us to be, this is what we want to become. The museum refreshed our memories and made the distant past, the living present.